Make sure to see our Sayulita Beaches section for six additional great Sayulita hikes. Also, read an article on Sayulita's most popular trail hikes: Sayulita Jungle Hikes. In general, hiking around Sayulita is mostly confined to hiking to different beaches. This is in part because any hike striking off inland into the jungle will soon find Highway 200. However, the hikes between town and outlying beaches can be full of adventure and offer the opportunity to see birds & wildlife as trails cut through the jungle. The Monkey Mountain hike does not involve a beach and a hill hike towards San Pancho can avoid the beach if you are looking for a break from the sand. Joining a hiking tour from a highly recommended local company offers fun and adventure. MexiTreks offers local hikes with an experienced, bilingual guide, such as the popular Monkey Mountain hike, hiking through dense tropical forest on the Camino de Jaguar, as well as fun day trips near Sayulita where you can hike to see ancient petroglyphs. Another local company, WildMex, offers fun, adventure and hikes for all skill levels. With experienced guides who know the area, are trained in first aid, bilingual, and are able to point out interesting birds and animals along the way, you will be sure to have a great adventure while on your Sayulita vacation. 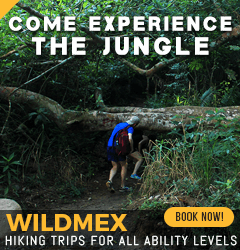 WildMex uses profits from hiking tours to help build and maintain the trails around Sayulita. Even though the hikes are easy on well-defined trails you should use common sense and take a few precautions. (1) Tell someone where you are going. (2) Carry water - 3 liters for a day. Suggestion - freeze a bottle of water overnight and wrap a towel around it when you set off and you will have cold water for later on. Take frequent sips rather than infrequent big gulps. (4) Carry a medical kit; if you do not have one collect together sun block, aspirin, a bandage - crepe/elastic preferably, antiseptic cream, bug spray, a whistle – to attract attention in an emergency. (5) a small flashlight would be a good idea. (6) Wildlife – encounters with animals will be rare, but snakes, scorpions, land crabs, insects and bird life are all around. Do not touch nor feed wild animals, some are dangerous. (7) All hikes can be done in sandals except Monkey Mountain. (8) Please do not go off the trails as this needlessly damages the plants and upsets the ecology of the area. 1. The easiest is from beyond Villa Amor. Follow the bay side road to the south (left when facing the sea) and choose your spot. 2. For a greater view of Sayulita, starting in the plaza take Calle Marlin (the street leading towards Don Pedro’s) and take the first left. Go down the dip and cross Calle Caracol (the first street you come to) and opposite you will see open land between two houses. Walk up the driveway or steps and take the floral zigzag path up the hill and you will be afforded a great view of the town and bay. 3. Another nice view of Sayulita is obtained from beside the top of Villa Amor. A 15/20 minute walk from the plaza take Av. Revolucion passed El Espresso, then first right and follow straight for about ½ a mile. The road then turns sharp right and up a short hill where it turns left and splits. Take the right fork and follow the road for outstanding views of Sayulita and the bay. 4. Gringo Hill lies behind the Sayulita plaza. Take Calle Marlin up hill and the first left following the road all the way to the top. Excellent north facing views over the town. Views directly over town and out to sea are not so easy to find but a helpful home owner/tenant may allow you to take in the view from their balcony. 5. Nanzal Hill - this one is going to take some effort. The view is breath taking – literally. 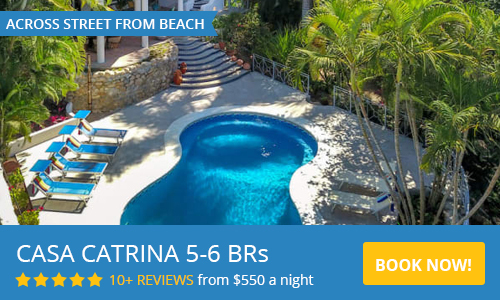 The climb is very steep but the panorama is exceptional, taking in Sayulita town and the bay, Punta Sayulita (the headland), Monkey Mountain and beyond to Punta Mita. Stunning sunsets. Take Av. del Palmar, the street which parallels the beach, north across the river and passed the campgrounds. After the school take the second right Calle Saylo - Casa Del Mar Sur is on the corner - then the first left, and follow the main road to the top. Be careful not to get side tracked onto Calle Loma Alta which has no outlet though offers beautiful clear views. 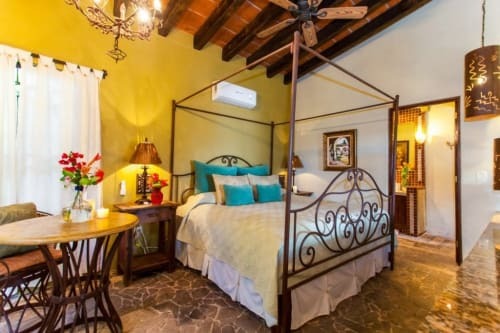 But, “you ain’t seen nothin’ yet!”, take deep breaths and push on to the top of Calle Nanzal where you can rest and recuperate with the most commanding view available of Sayulita. Hiking monkey mountain near Sayulita Monkey mountain, near Sayulita is considered sacred to the Huichol Indians and is one of the most distinctive features of the surrounding landscape. Head south from Sayulita on the road to Punta Mita. At the 5kms. marker take a right towards Playa Patzcuaro. There are no signs. About 1km. down this road you will come to a ranch. Just beyond and over the river the road splits with the main track straight ahead leading to Playa Patzcuaro while an unused road will take you south (left) from here through the jungle to a trail leading to the top of Monkey Mountain. Make sure to pack food and plenty of water for this 4-hour Sayulita hike. Another jungle/hill hike from Sayulita is towards San Pancho, off of Playa Malpasos. Inland route: From town walk along Av. del Palmar (which parallels the beach) across the river, passed the campsites and school until it ends at a condo complex. Shortly you will cross a small river (dry in the winter) the main path appears to follow the river to the right but look straight ahead and you will see several large boulders. Clamber over or go around the rocks and follow the path across a cobblestone road (which is a private road from the beach-house to the main highway) and continue straight. You will go over a small rise and a dirt road will join from the right. Approximately 50 meters further the path splits; left goes to Las Cuevas Cove, you go straight ahead down the wide track for 20 meters and through an open gate and follow the path as it angles left and down towards the beach. You will come to a small yellow house in ruins and a cement block building in a clearing beside the beach. SEE BELOW FOR DIRECTIONS, BUT BE AWARE THAT SWIMMING AT PLAYA MALPASOS IS NOT RECOMMENDED, THERE ARE STRONG UNDERTOWS AND RIPTIDES. USE EXTREME CAUTION. For real exercise, walk along Playa Malpasos to the neighboring village of San Francisco (aka San Pancho), four miles north of Sayulita. One end of the town beach is very swimable and the other end is home to Costa Azul Adventure Resort, a nice place to have a drink and watch the sunset. In the middle lie the quiet cobblestone streets of San Pancho. After Playa Malpasos, you'll pass the former estate of one of Mexico's former presidents. 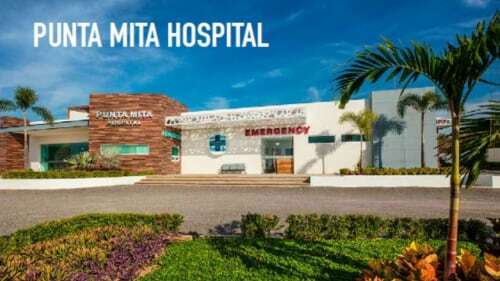 Here you might have to practice a bit of citizens' action because the new owners have blocked access, which is against Mexican law. People still cross by ignoring the "no trespassing" signs. Hopefully by the time you arrive, this situation will no longer be an issue. Refreshment, and a taxi ride back home, available in town. San Pancho is accessible by Highway 200. Please note that sometimes the gate at the end of Malpasos beach is chained and locked, so no access to town is possible via this route when gate is locked.